Stadium-sized art-rock act Radiohead released their The King of Limbs LP way back in 2011. Over three years since its release date, the band are just starting to think about a follow-up. The group recently took a year-long hiatus, in which time the members focused on other projects. 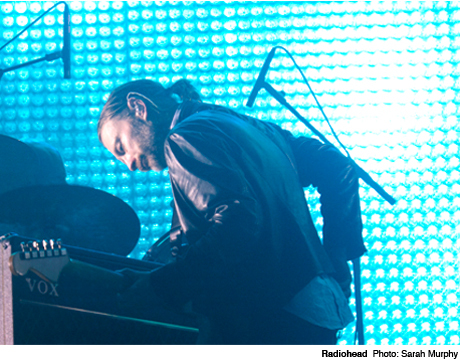 Thom Yorke formed the Atoms for Peace supergroup, Jonny Greenwood prepared a film score and Phil Selway recorded a new album. Now, however, the band members are gearing up to return to their day job. Jonny Greenwood recently spoke with Mary Anne Hobbes on BBC 6Music, where he revealed that the band are planning to reconvene in September of this year. "We're going to start up in September, playing, rehearsing and recording and see how it's sounding," he said. That said, don't expect to hear new material from the group too soon — as Greenwood put it, the project is a "slow moving animal."